“Pirates of the Caribbean: Dead Men Tell No Tales” fails to get the 14-year-old series back on track. While it is an improvement over the previous sequel, “On Stranger Tides,” directors Joachim Rønning and Espen Sandberg succumb to many of the same problems found in that film. For starters, the character of Captain Jack Sparrow (Johnny Depp) is no longer the charming antihero he once was – straddling the line between good and evil – but rather a drunken pirate who wanders aimlessly through set pieces. Unlike Gore Verbinski’s massive sequels, the action sequences aren’t enough to cut it here. They’re surprisingly infrequent over the course of Sparrow’s search for the legendary Trident of Poseidon. Although screenwriter Jeff Nathanson attempts to return the franchise to the simplicity of the first movie, it lacks the same energy, and that’s a problem that begins and ends with Jack Sparrow, a character who had something driving him in the 2003 original. He used to have a personal motivation and real conflicts, but now he just drinks a lot, keeps making the same old jokes and finds his way out of sticky situations just as you’d expect him to. He’s lost his unpredictability. This time he’s on the run from Captain Salazar (Javier Bardem), a performance and visual effect that’s never quite convincing. In his younger years, Jack Sparrow helped turn the pirate killer and his crew into ghosts, and now that Salazar has escaped the Devil’s Triangle where he was imprisoned, he goes hunting for the man who not only damned him but is the only one who can save him. 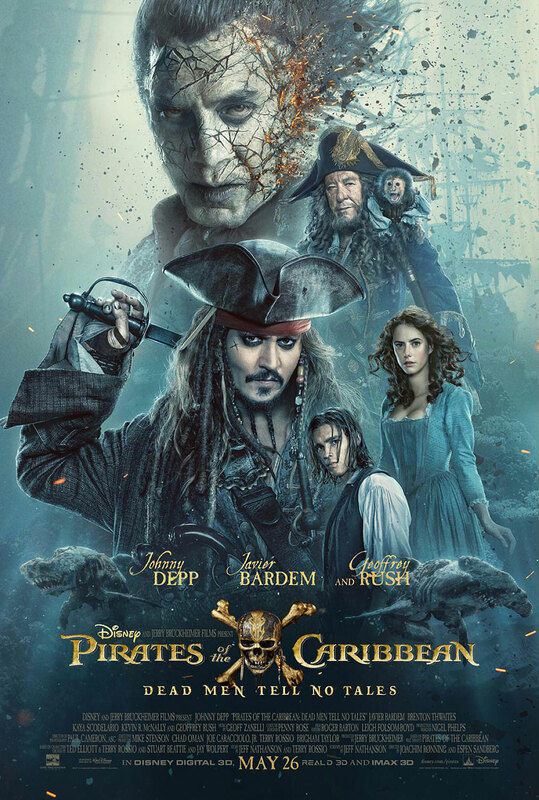 Nobody knows where Sparrow is, including Will Turner’s son Henry (Brenton Thwaites) and an astronomer accused of witchcraft named Carina (Kaya Scodelario). Sadly, Henry and Carina aren’t particularly lively additions to the cast, as they pale in comparison to the colorful supporting characters this series once featured, such as Captain Barbosa (Geoffrey Rush). Sparrow’s old foe is still present and has a strong payoff here, but it’s not enough to bring much heart and soul to the movie.